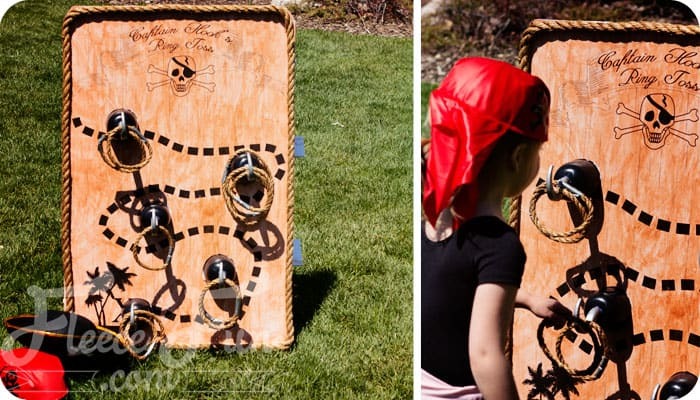 These Pirate party games and activities are sure to be a hit for your guests. 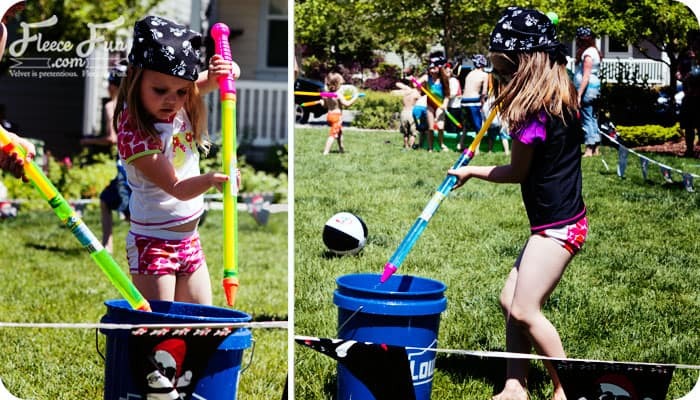 We have ideas for pirate party games that will fit several age groups! 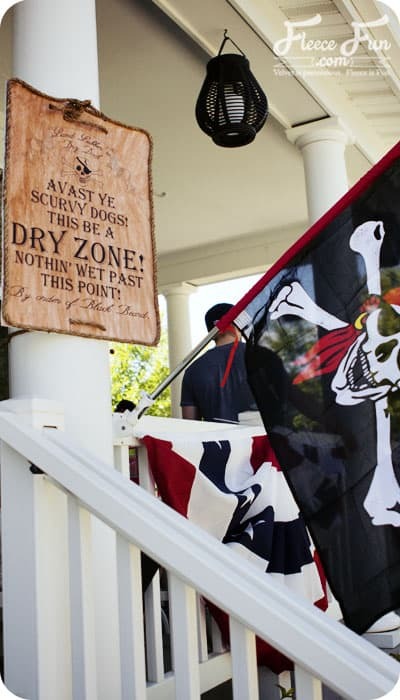 We set up different zones for the pirate activities all over the yard. We had a space sectioned off using these pirate pennant banners for the relay races and team games. Act and Dress like a pirate. 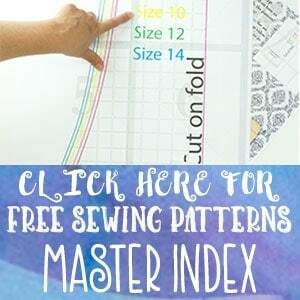 Before we began the games we had the kids dress like a pirate we gave them Pirate bandannas ( you could also have them make their own hat using this free printable here). We had them practice saying “Arrr!” really loud. When we wanted to get their attention we would yell “Pirates say Arrr!” they would yell it back and we get the crew back under control. Fun and easy to make this ring toss game is a crowd pleaser. 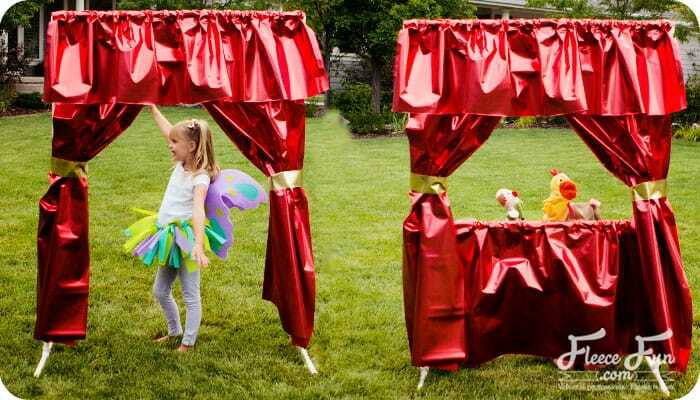 Little kids can toss the rings closer to the sign and older ones can stand farther back to make it more challenging. You can get the free pirate party games printable and instructions here. 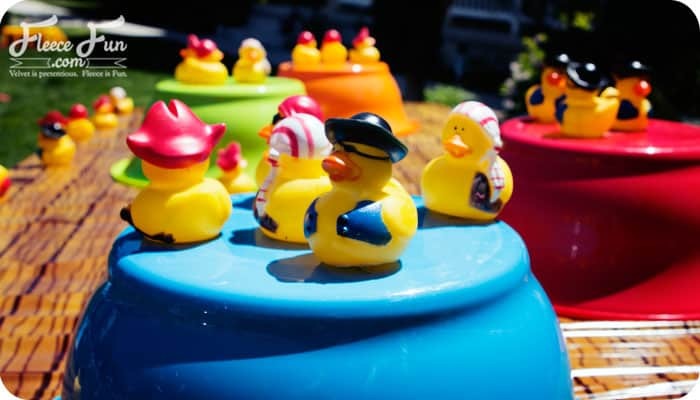 We set up Pirate ducks on a table using plastic bowls to make different levels. We then used these water soaked sponge balls to throw at the ducks to knock them over. You can find the rubber ducks here and the water balls here. We filled the base of these blow up palm trees with water and kept the balls in there – cute and functional! (plus they came in handy for #6). We set up this blow treasure chest and filled it will water to keep it stable. We then propped open the lid slightly to make a tiny slit. Contestants would then try to throw a frisbee into the gap to win points. You can get the treasure chest here and the frisbees here. And grrr, or should I say “Arrr!” I was so busy at the party I totally spaced taking a picture of it. We marked off and area for a couple of relay games and divided kids into teams. We gave each kid a water gun and each kid a beach ball. We had a little splash pool filled with water at one end of the yard and empty buckets at the other. The teams had to fill their water guns and the water to push the beach ball to one end of the yard, have it tap the bucket and push it back. 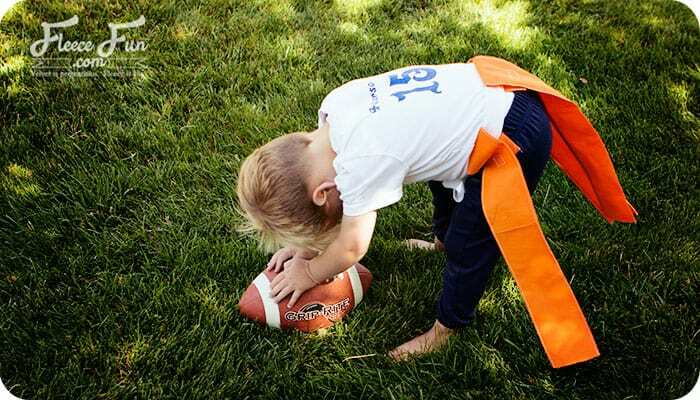 A kid would push the ball until they ran out of water and then the next teammate would run up and take over. You can get pirate party games beach balls here. 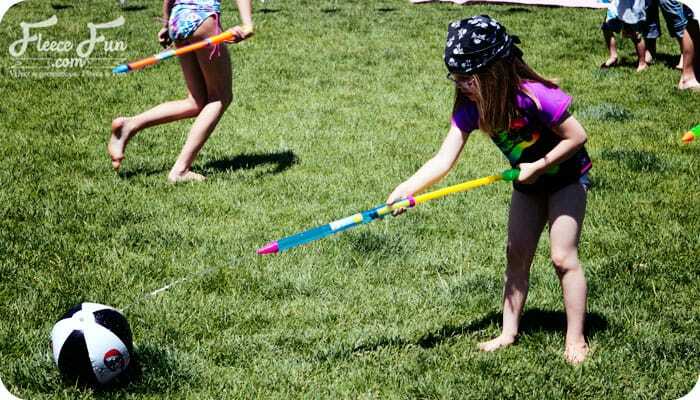 The teams would fill their guns and run from one end of the yard to the other and squirt their gun into the bucket. The first team to fill their bucket with water wins. Hint – let the entire team work on it all at once or the game will take too long. You didn’t think you could hand the kids a bunch of water guns and not let them have a water fight, did you? 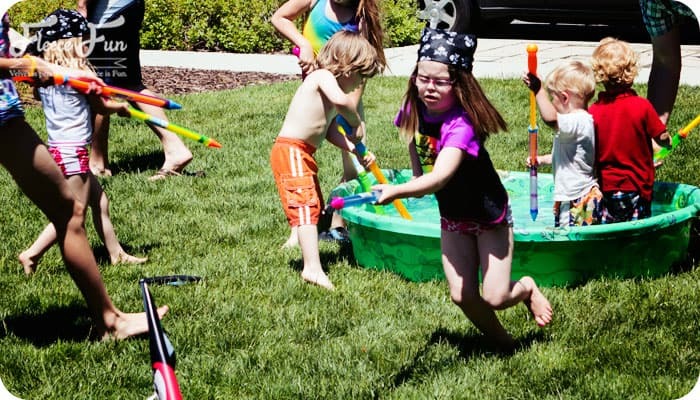 Let the kids have a blast getting each other wet in all out water fight. For this we let them also use the water sponges from the ducky throw and strategically filled water stations all over the yard. This is when adults should retreat to the “Land Lubber’s Dry Dock”. You can get that tutorial here. You can get that large pirate flag here. It’s a classic for a reason. Use the free printable here to make a basic treasure hunt for the kids. Let them find a treasure chest (like this one) and enjoy their spoils. 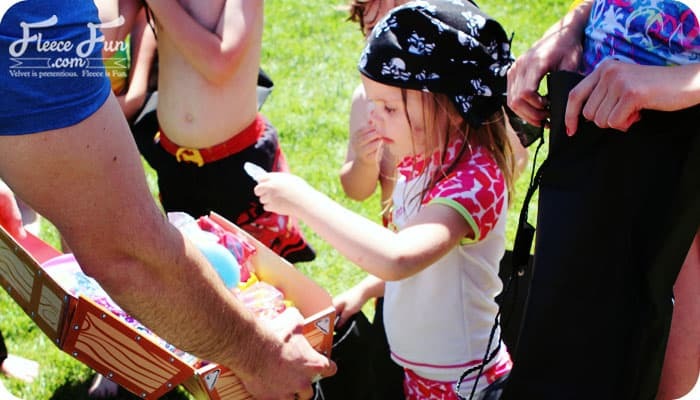 We supplemented a few of the toys that came with the chest with pirate coins, pirate telescopes and pirate eye patches to keep it very “piratey”. We gave them each one of these bags to hold their booty in. We really enjoyed our pirate party. And the kids were really worn out at the end ( which in my opinion means that they had a good time!). Do you like these pirate game ideas? 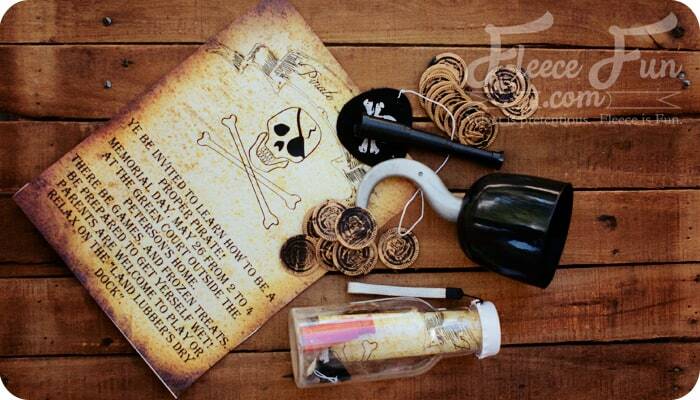 Are you planning on throwing a pirate themed party? 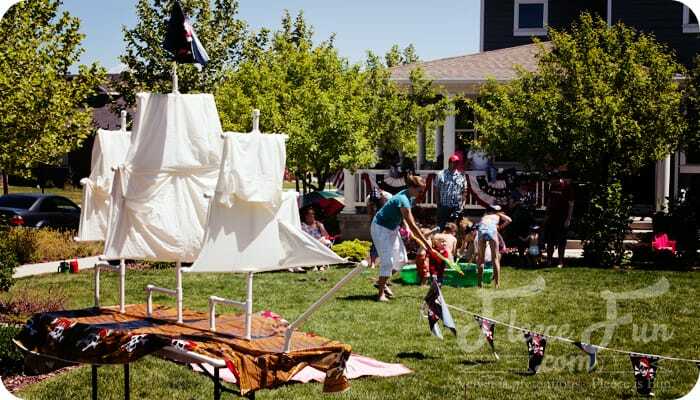 Learn how to build this fun PVC pirate ship. 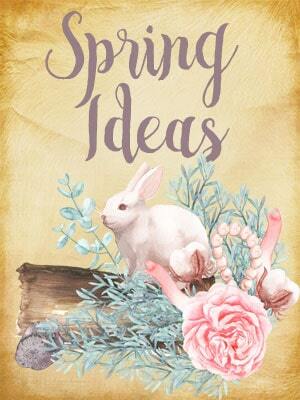 Get the tutorial and plans here. 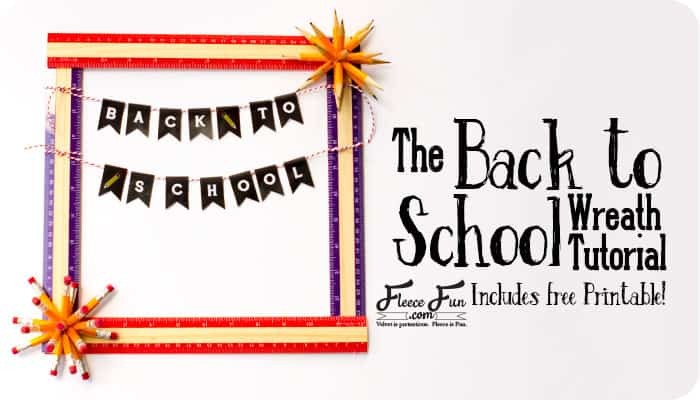 Pirate Party invitation ideas and a free printable for you! Get that here. 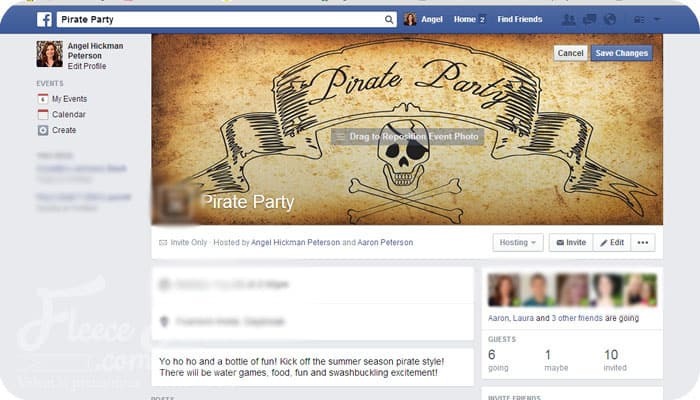 Learn how to set up and invite friends to your even via Facebook – and there’s free timeline art you can use to keep the Pirate theme going! You can get that here.